Excited for the NBA Finals? Join the BDL crew for a live Finals Chat on Twitter during Thursday night's Game 2. We'll be cracking jokes, sharing observations and talking about the game with NBA fans like you. Participate by using the hashtagÂ #FinalsChat, and don't forget to followÂ @YahooBDL for your daily NBA fix. â¢ The Oklahoma City Thunder beat the Miami Heat in Game 1 of the NBA Finals, scoring 105 points in 48 minutes and an average of 118 points per 100 possessions against one of the league's three or four stingiest defenses. â¢ Kevin Durant scored 36 points in that game, including 17 in the fourth quarter, and hit more than half of his shots in the process. His team won. â¢ LeBron James scored 30 points in that game, including seven in the fourth quarter, and hit less than half of his shots in the process. His team lost. â¢ LeBron James was the leading vote-getter for the league's All-Defensive first team this season, and is considered by many right-thinking humans to be the league's best and most capable perimeter defender. â¢ Kevin Durant is by trade a perimeter offender, and he was again in Game 1, with 12 of his 20 field-goal attempts coming from 10 feet away or further, according to Hoopdata. These are facts, and disputing them seems, at best, foolhardy. So, then, it would stand to reason that after attempting to switch pick-and-rolls all over the floor to keep his defense from being overextended, frequently leading to Durant or Russell Westbrook facing a favorable matchup, one of the strategies Miami coach Erik Spoelstra must be considering for Thursday night's Game 2 is to sic his team's top Doberman on the opponent's prime scorer, right? LeBron James wants to guard Kevin Durant; that much is clear. This is one challenge James is not dodging. [...] Spoelstra tried a tactical approach in Game 1 that had sound reasoning behind it, but it didn't work. It's time to change, put the best defensive player on Oklahoma City's best offensive player when the game is on the line, and stop being so defensive about everything. "Coach gave us an idea for Game 1, and we went with it," said James, who'd pointed out after the game Tuesday night that it "wasn't my choice." There is a whole lot of other stuff in Berger's column about how Erik Spoelstra uses doublespeak and nonsense to hide his true intentions, and to be honest, all of that stuff strikes me as totally unimportant and ridiculous â" a coach's job isn't to explain all of his decisions meticulously and clearly to us, it's to coach, and if Spoelstra doesn't want to make his strategy plain, well, then, that's what he wants. It stinks for dudes writin', but still, it's all in the game. Spoelstra's diction aside, the question remains â" should James check Durant? On its face, the suggestion makes an awful lot of sense â" a 6-foot-9 defender with the length to potentially even bother Durant's nearly-impossible-to-deter high release point, a weight and strength advantage that could enable him to body up and bully the three-time scoring champ, and the quickness to stay with the hiccup-fast Durant off the bounce seems like the perfect deterrent for the league's most deadly and versatile offensive weapon. The idea seems even stronger when you realize that most of Durant's scoring work in Game 1 came against other opponents. In Game 1, Durant mostly worked against Shane Battier; by my count, 12 of Durant's 20 field-goal attempts came on possessions where he was initially checked by Battier, over whom Durant has a considerable edge in quickness, (at least) a two-inch height advantage and over whom he can hoist a shot at just about any time. And on five of those Battier-begun possessions, thanks to a combination of elements â" off-ball work by Durant, ball movement by the Thunder and Miami's determination to switch screens on defense â" someone besides Battier or James wound up responsible for the league's leading scorer. Four times, it was the much-shorter Dwyane Wade â" a straight-on 3-pointer early in the first quarter, a midrange floater early in the fourth, a long jumper with just under five minutes remaining (after both Wade and Battier left Durant alone to honor a slipped screen and dive to the basket by Derek Fisher) and a 3-point try with four minutes left. Once, it was the also-much-shorter Mario Chalmers, although that's a bit unfair â" the Heat point guard was just the closest defender to the ball after a Nick Collison tap-back of a Russell Westbrook miss led to a fresh shot clock and a quick-trigger Durant 3 with 6:30 left in the fourth, and at least he tried to contest. On those possessions, Durant scored nine points on 4-for-5 shooting. Beyond that, Durant got several buckets in transition and one off an offensive rebound â" unsettled-situation points where it's tough to pin the blame on any one defensive lapse, and you just sort of tip your hat to the offense for finding the open man on the break and/or the scorer for getting himself in position to put it in. He also made eight free throws â" one after being fouled on Chris Bosh on a transition layup, one after a Wade foul, four after second-half bailout hacks by Udonis Haslem, and two after an out-of-necessity foul by Battier in the final minute of the game with the Thunder up nine. But when you re-watch the possessions on which Battier defended Durant, the Duke alum seemed to do about as well as you can expect to do as the primary defender on Kevin Durant. Battier held Durant to to eight points on 3-for-7 shooting, hustling to stay with him through staggered screens, working to close out after sagging to help on the interior, and frequently getting a hand in the Thunder star's face in a way that Durant (and probably everyone) hates. For the most part, Battier provided strong defense; it wasn't like he got torched and that's why the Thunder took Game 1. On the contrary, not only did most of Miami's defensive missteps in Game 1 take place off the one-on-one Durant matchup, but as SB Nation's Mike Prada points out, they're pretty correctable miscues that the Heat will likely be able to tighten up in Game 2 even if they don't put James on Durant for long stretches. Of course, as Ethan Sherwood Strauss wrote at HoopSpeak, there's also a halfway decent chance that no matter what new defense the Heat devise for Durant, they won't actually do more than momentarily impede him, and , could just wind up opening doors for other OKC scorers. Plus, if Wade and Bosh continue to struggle to generate offensive opportunities and hit shots in Game 2, there's also the real worry about Miami forcing James to both guard its opponents' best player and act as its sole legitimate point-scorer and shot-creator for a full game, which is a really, really tall order even if you are not carrying around a 270-pound frame for 48 minutes in the NBA finals. I mean, that's a lot to have to do. So: Will LeBron James guard Kevin Durant Thursday night? The answer is probably yes, and probably more frequently than he did in Game 1, despite the fact that Shane Battier actually did a pretty sound job of it. 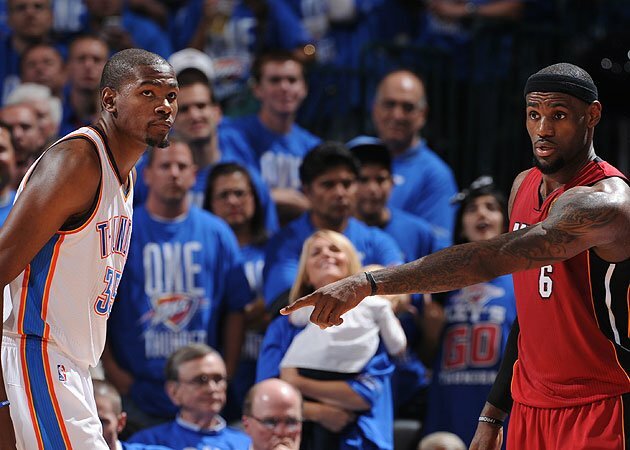 Should LeBron James guard Kevin Durant Thursday night? The answer is probably yes, though probably not too much, because it's unclear whether James guarding Durant would actually do a whole heck of a lot to prevent Durant from scoring more than half the time he tries to do so; if Miami's not going to continue trying to switch everything on the perimeter, James on Westbrook might wind up being a more interesting gambit for Spoelstra to try. Ultimately, will James' defensive assignment wind up changing the outcome of Game 2? It's hard to see it mattering too much if Miami's other stars continue to miss shots, but if you're a Heat fan, I guess it's pleasant to think so. If nothing else, it gives us another LeBron-focused topic to consider, and I guess there can never be too many of those, now, can there?